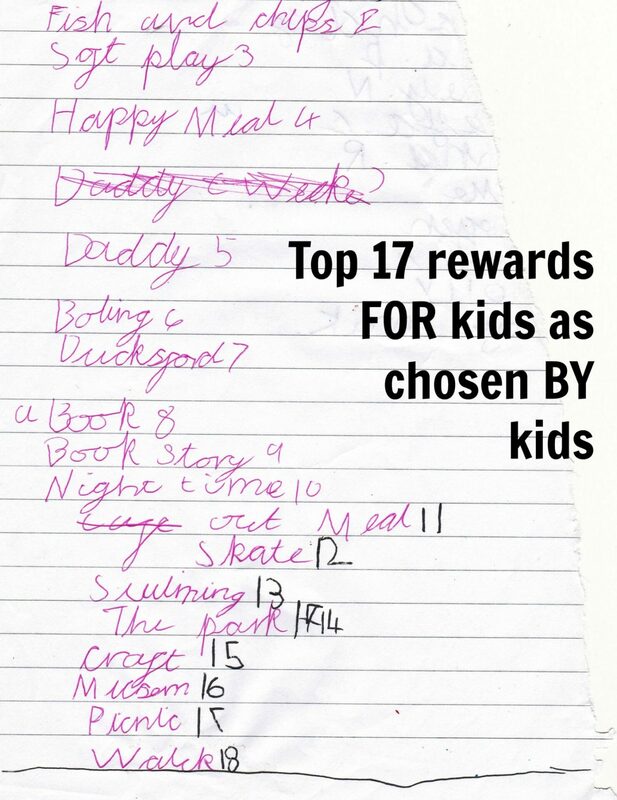 Good rewards for kids: 17 top reward ideas FOR kids BY kids! What makes good rewards for kids when you are using one of our progress charts or reward charts? I have written about what rewards you can choose for your reward charts in the past – and what often works well is doing something that gives your kids a little bit of one-to-one time. Anything from a full on crafting session to a bit of a run about in the park. But what would YOUR kids choose if they were given the chance? I asked my kids, and they drew up this list of ideas for you all…. And in case you all need a little bit of a translation, they picked the following…. As you can see, some of these are incredibly simple, such as an extra story, or song before going to bed, but are enough for them to be more than happy with their achievements, and their chose rewards for whatever it is we are trying to encourage. It doesn’t have to be a new toy, or a £50 piece of kit. Sometimes a cuddle, a bit of praise, and a smile is all it takes, and is reward enough for your child. What do you think? What would your kids pick as their treats? Would they have anything else to add to my children’s list? A very good choice my dear – if we had one, I am pretty sure my kids would be following u all in!